It's getting to be that time of year when the work schedule has set in and fishing time is becomming limited. That's not to say I don't stay up to the midnight hour burning candle light, tying up whatever is comming to me at the vice. I am slowly getting more than one box of flies that is an "all purpose" box. 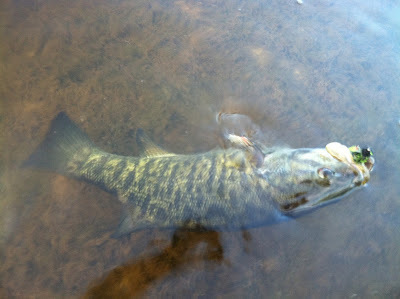 I am starting to try and put my finger on our spring fish's kill instinct. Last year, while I was finishing up my general sciences Assosiates Degree, one of my mothers co-volunteers passed a 8ft 6wt loomis Gl3 with an old school battenkill 5/6 that purrs onto me. I am finally putting it to work. What I have done is taken a beat up SA 8wt mid belly and cut it way back so that between the transition into running line and where I cut is about 13 ft; with a 5ft chunk of t-8 and 3-4ft 10lb flouro to my fly. I am not going to try and say it doesnt feel a little, "ghetto" but hey its working. I will be expierimenting with more streamers so stay posted as I hope to bring you some effective patterns!!! 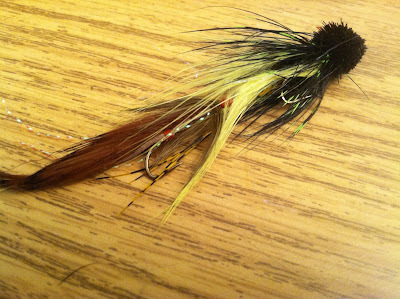 I tied a couple of these over the past couple nights. 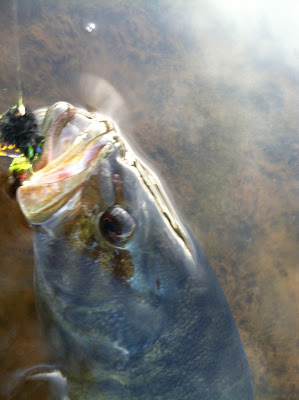 I got a couple of the local bass to go with it .... literally on the first cast, and its been a while since I grabbed the leader to unhook a fishy so it was good to shake the skunk! Our migrating fish are on their way to hopefully a strong recovery from the spring spawn. We do have stray atlantic salmon and late dropbacks being found around the mouths of the northeast side.